Almost heaven, West Virginia. So goes the John Denver song Country Roads and we sure took a lot of country roads in our first foray into WV. I say our first because we will actually make two, one this year and one next. 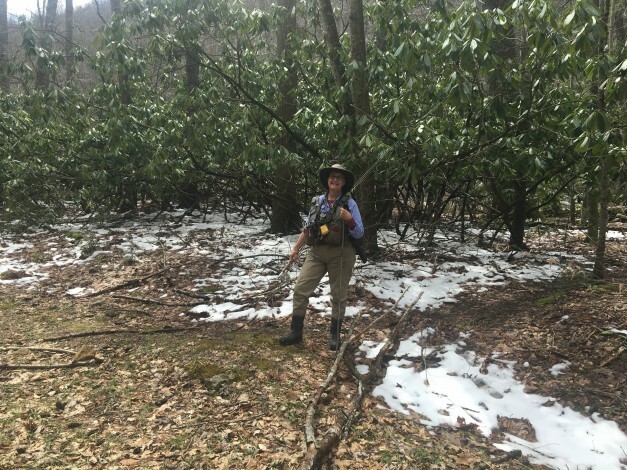 This year’s journey took us to the Cranberry Wilderness area of WV to fish the Cranberry River. When we were doing our research into each river, finding shops and guides for our first day in each, we found that there were no guides working the Cranberry. Seemed strange, having a Top 100 trout stream and no guides but we’d fished enough and were confident enough to just seek some local advice and trek out on our own. We found Four Seasons Outfitters in Richwood to be great. The staff there set us up with flies… shared a map with us and highlighted some areas to fish… and talked about how they’d fish the river. Nymphs deep or streamers drug through deep holes. Pretty standard stuff. What they also told us was that to get to the “catch and release” section we wanted to fish, we’d have to hike at least 7 miles. Ummmmmmm,,,, 7 miles? Barb and I love to fish but we’d never walked 7 miles to do so. 3 miles, no problem. But 7? On an old railroad track turned into a path? Up a mountain? So we negotiated and got them to admit that if we just walked up a bit over 2 miles we’d find fish but we’d also see more anglers fishing “catch and keep” with trout bait. Undaunted by this, we started our trek into the Cranberry Wilderness on the trail and within minutes saw a guy coming at us riding a bike. When he got closer, we noticed he had a fishing rod stuck in a piece of PVC pipe attached to his bike. He’d been fishing! We knew the area was known as a mountain bikers haven but a fishermen’s too? Turns out it is the common way people access the river to fish…. biking it. Next time we’re getting bikes. The hike up for a little over 2.5 miles was filled with excitement fishing this beautiful stream. The hike back about did us in. And to top it off, it had just snowed in the mountains and the fish bite was off. No one was catching fish that day. Luckily, we went back to the river a couple of days later and hooked into some pretty fish. 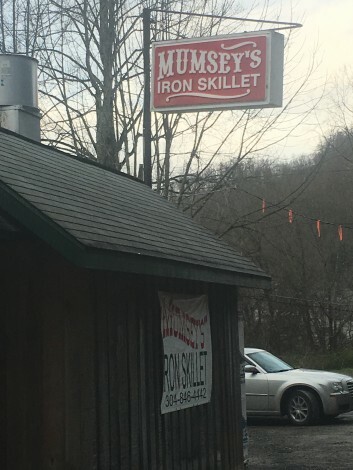 We found our goto spot for breakfast on the trip, Mumsey’s Iron Skillet in Richwood; right on the Cherry River with great food. We got to meet some of the locals and got some great intel on things to do in the area. One local we met was Dr. Lloyd Atkins, the town dentist. Turns out, Lloyd is an avid fly fisherman. We sat and talked each time we were at Mumsey’s and got great information and lots of exciting stories. Also need to give a big thanks to Lee Orr, the President of WVTU. Lee also traded emails with us about where and how to fish. He put us in touch with an outfitter on the Elk River we’ll visit when we swing back through WV in 2017. We just missed by a week the annual Ramps Festival in Richwood, which bills itself as the Ramps Capital of the World. We saw ramps signs all around the town and wondered what they were. Turns out, ramps are kind of wild onions, sort of like a leek, really pungent like garlic and are in high demand because the season for finding them is so short. As one person indicated, its kind of like waiting for Punxsutawney Phil to come out after the snow melt. For Barb and me, we likened it to morel season. We asked if they also had morels in the area and they did; they just don’t get the love that ramps get. OK… we are off to Maryland… time to Ramble On! We are celebrating our 30th day of our adventure. We’ve driven 1581 miles so far and have been in and through 9 states. 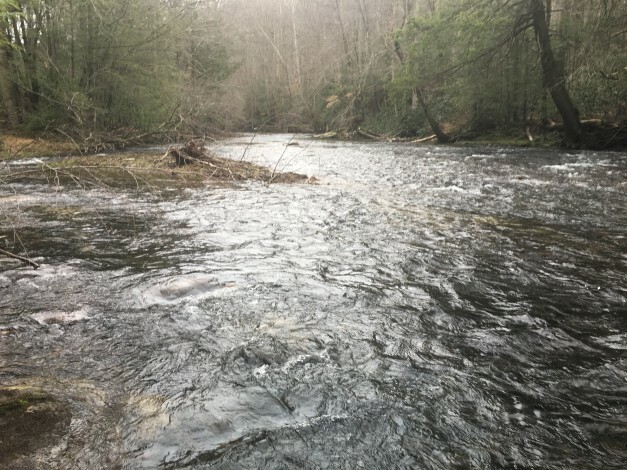 We have fished 7 of the Trout Unlimited Top 100 Trout Streams: our home river, the Guadalupe in Texas; 2 Georgia streams, the Chattahoochee and the Toccoa; and 4 in North Carolina, the Chattooga, the Davidson, the Nantahala and the Tuckasegee. In addition to those 7 TU Top 100 streams, we’ve now fished 9 additional streams that could all have been in the Top 100. More importantly, we’ve met the most incredible people along the way. 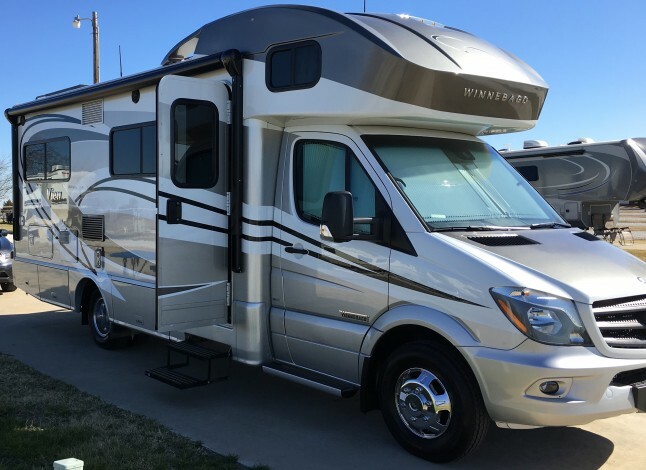 We’ve been staying in RV parks, forest service campgrounds, state parks, and a national park. The camp hosts have been incredibly welcoming and helpful. We’ve had the most incredible fishing guides. Big shout outs to Chris Scalley of River Through Atlanta, Chuck Head of Unicoi Outfitters, Hunter Morris of Unicoi Outfitters , Harrison Beckwith of Brookings CV Anglers, Miller Watson of Hookers Fly Shop, Nick Johnson of Endless River Adventures and J.E.B Hall of Davidson River Outfitters. We cannot say enough about their patience, their sharing and their enthusiasm in putting us on fish and keeping us safe as we hike and float the rivers. The fly shop staff have also been invaluable in helping us get the right flies and pointing us to the best spots to fish when we trek out on our own. Big kudos to Jimmy at Unicoi, Marc at Brookings, Walker at Davidson River Outfitters and Bobby at the Tuckaseegee Fly Shop. We’ve made some lifelong friends along the way. The SaraLinda has been our transport and our home for these 30 days. Yes, we’re living in about 180 sq.ft. but in reality we’re outside most of each day either fishing, hiking, touring around or taking care of the RV. 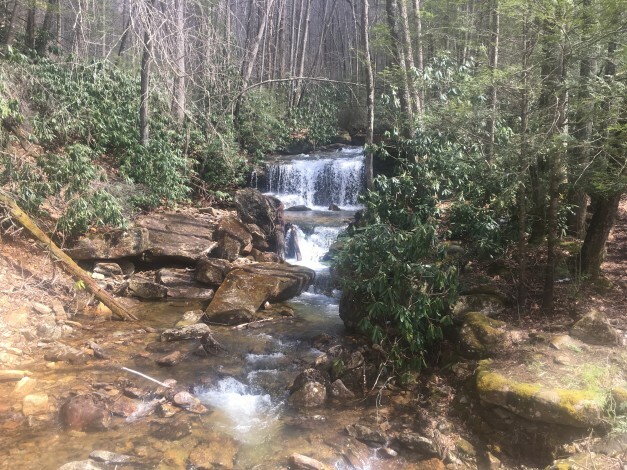 Our backyards have been the Great Smokey Mountains National Park, the Nantahala Gorge, the Blue Ridge Mountains and numerous streams. We hope you’ve enjoyed tagging along with us on this journey and will continue to follow us. We’re headed to West Virginia next! 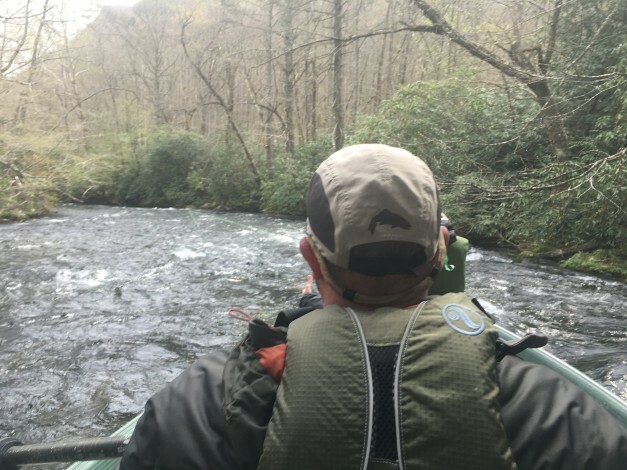 We divided our time on the Nantahala between doing a couple of wade fishing trips on our own to the delayed harvest section and doing a float trip with Nick Johnson of Endless River Adventures. Both were amazing experiences with more stories to tell. 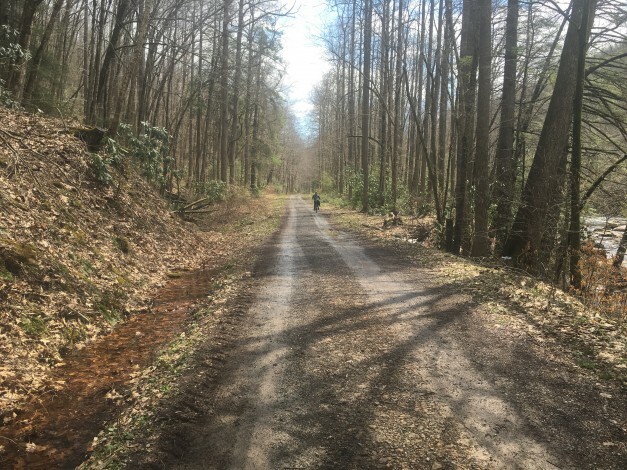 Rather than a video, I’m going to try and describe our Nantahala adventures with pictures and words. It all started when we first drove down from Bryson City NC to the Nantahala. As you drive along you see a sign welcoming you to the Nantahala National Forest and the Nantahala Gorge. We were excited to see the fishing symbol on the sign but a bit perplexed when we also noticed the whitewater rafting and kayaking signs. 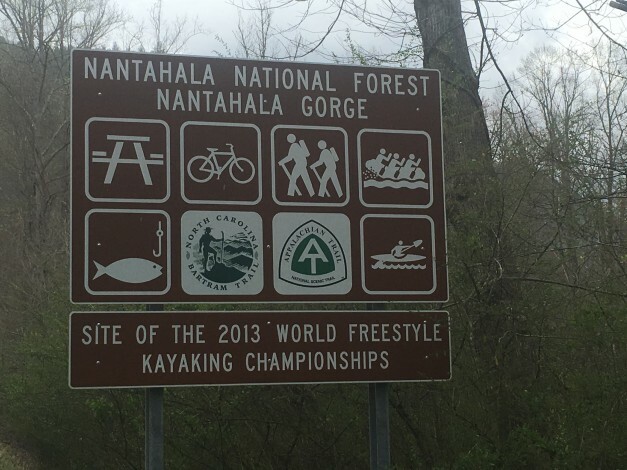 Then, reading the bottom of the sign we saw it was the site of the 2013 World Freestyle Kayaking Championships. Our immediate thought was…. and we’re going to fish this? 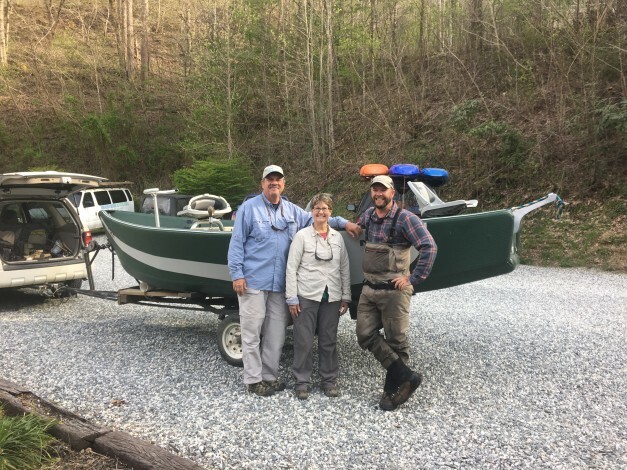 We had some great advice from The Tuckaseegee Fly Shop in Bryson City from Bobby about where to wade fish and what to use. Purple was the color fly he recommended both in a girdle bug and a bead head nymph. He was so right. We caught beautiful fish in pretty much every hole we fished. It was so good we went back the next day to wade fish the section again. Still, every day we had to drive by the section of the river that was crazy with whitewater and saw nothing but rafters and kayaks on the river. Not a single fisherman. Finally, it was our day to go. It was cold and we both had on layers of pretty much everything we had to keep warm. We met up with Nick at the shop and proceeded to our put in spot. Seemed calm there but we had to wonder as we walked down to the boat and saw the sign, “Life Jacket Required”. Undaunted, we put in and started our float fishing trip journey down the Nantahala. We immediately were into white water and didn’t even put a line in the river for about a 1/4 mile while Nick navigated the drift boat through a rapid called Patton’s Run. When we finally did wet a line, it was fish on. 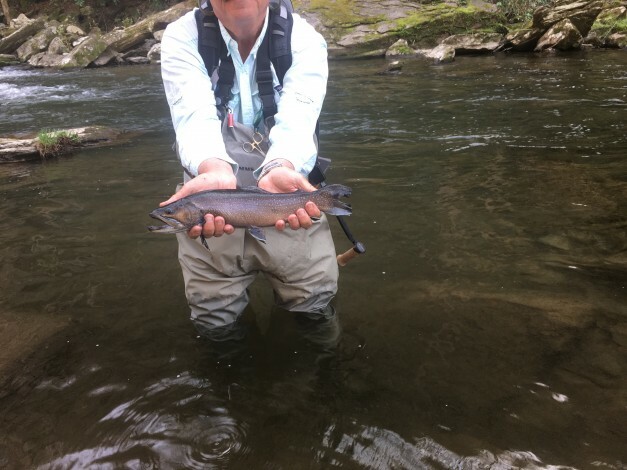 While the fish we caught up in the wade section were bigger, the fish in the whitewater section of the river who were willing to let us catch them were in the 6″-12″ range. But oh my they were so colored up and gorgeous. We proceeded to fish our way between rapids with names like Tumble Dry, Raft Trap, Isle of Dumping, Pop’NRun, and Pyramid Rock. That was all before pulling over in an eddy and having lunch. After lunch we fished between the rapids Delebars Rock, Quarry Rapid, Root Canal, Whirlpool, Little SOB, Blowing Springs, Picnic Rock, Surfing Rapid, Eddy Rapid, Devil Kitchen Caves and The Bump. Whew! Shortly after going over one of the last rapids, we were fishing a hole and saw a young woman floating down the stream, obviously in distress. She’d fallen out of one of the rafts and was floating down through the rapids clutching her paddle. She also was apparently having an asthma attack. We were able to pull her into the boat and get her to the side where help finally came. It was a blessing we were in that spot at that time. 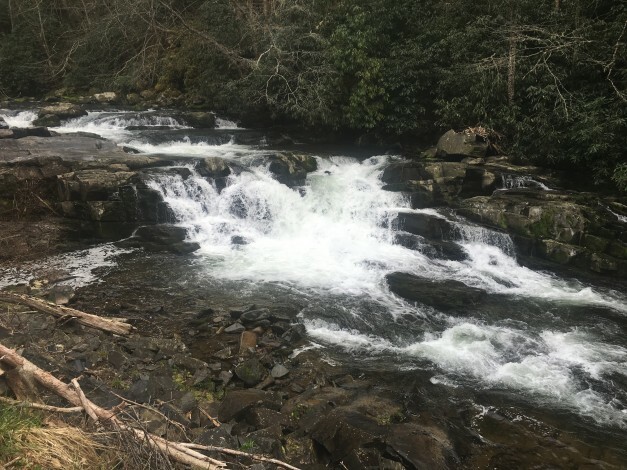 The next rapid she would have encountered was Nantahala Falls, a Class III/IV rapid. Two things came to mind: 1. Our guide, Nick, was well trained in rescue on the river. 2. Life jackets required!!! It was a very sobering experience to end our day but we’d already caught well over 20 fish on the river so it was time to get out. Only one problem…. Our take out spot was below Nantahala Falls. Luckily, Nick let us get out in a soft water spot just prior to the falls. We were able to hike down and watch Nick go over in our drift boat. He did it with no problem but it was clear that you need to have an experienced guide when you are on such waters. He’d rowed hard to get into position to go over the falls. We were happy to greet him and head back to the shop for a great day ending pic by the boat. We normally would have done a “Guide Talk” video with Nick at this point, but we all felt like our day had been a full one with fishing and helping out others. It was a special day and one we will always remember.